User Console is a tool for you to browse your application users on the developer portal. You can get a list of all application users by launching the user console with the following steps. Select the application on the developer portal. Click on the "Users" icon. The first two hundred users will be displayed. When the user scrolls to the end of the result set, the next page of users is fetched and displayed. This continues until there are no more users to fetch. You will see a rotation icon when the console is fetching the next page. 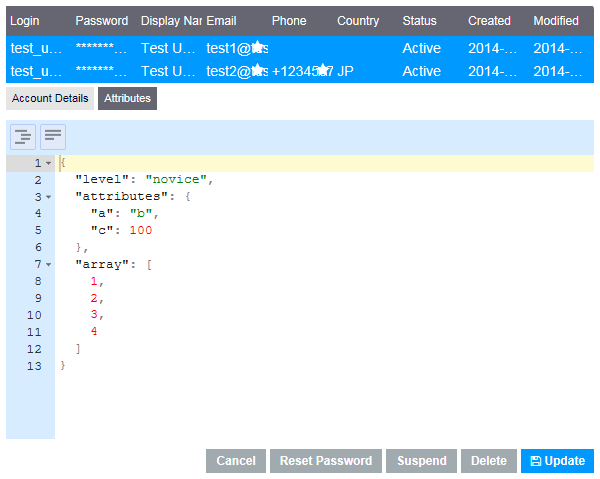 You can freely filter the user list for all columns except Password, Created, and Modified. To filter the list, click the small arrow on the right of a column. This will bring up filtering option. 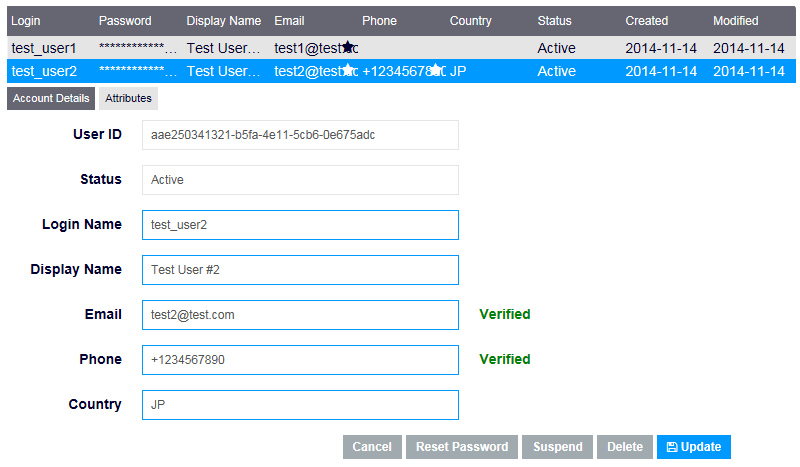 The "Phone" and "Email" columns allow you to filter the user list with the verification status ("Verified" and "Not Verified"), along with the "Starts with" filter. 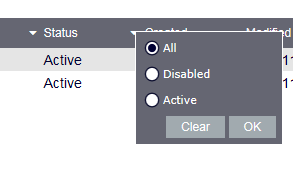 The "Status" column allows you to filter the user list with the user status ("All", "Active" and "Disabled"). When you set multiple filters, they are combined with an AND. Each filter can be individually cleared by clicking the "Clear" button in the filter options. Clicking the refresh icon, located at the upper left corner of the list, will clear all filters, reset all sorting changes and show the latest user list. Users are added inline in the listing table. Clicking "Add User" button brings up the following form. When the user is successfully created, the success message will show up. If something goes wrong, the error message will show up with the failure reason. Hovering over any row and clicking a row will bring up the edit screen. From here, you can perform the following operations. Enables or disables (suspends) users. Resets user passwords. This requires a verified email address. 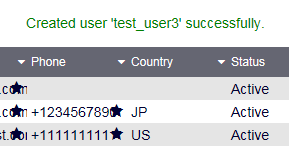 You can also modify the user details. In this case, make sure to save the modification by clicking the "Update" button when you are done. Clicking the "Attributes" tab will bring up the custom field editor. Any valid JSON is accepted, provided it is a JSON object (not an array or otherwise). These are saved to the custom attributes of the user. 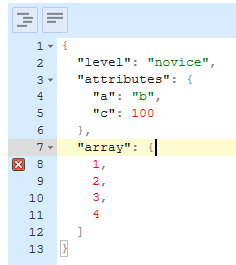 Syntax errors will be displayed, like the following screenshot, to the user when there is something wrong with the content. Mousing over the error will give more information. Clicking "Update" will save the changes to the Kii Cloud. Clicking "Delete" will first show this confirmation dialog, and then delete users from the Kii Cloud.